I don't like to brag because I'm convinced it's bad karma, but last week I made out like a bandit on Craigslist. 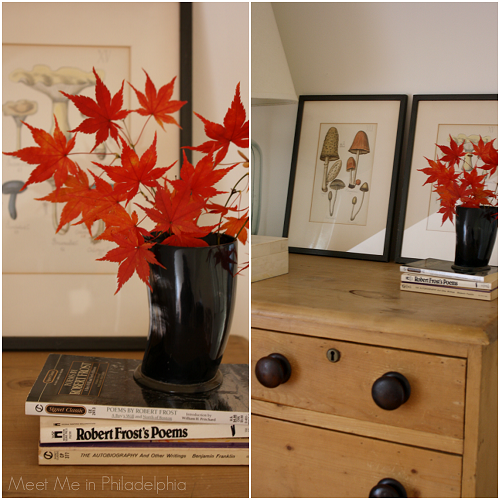 Combined, my two finds were just over $100 which is a pittance compared to the beauty and function they add to our home. Let me show them to you! 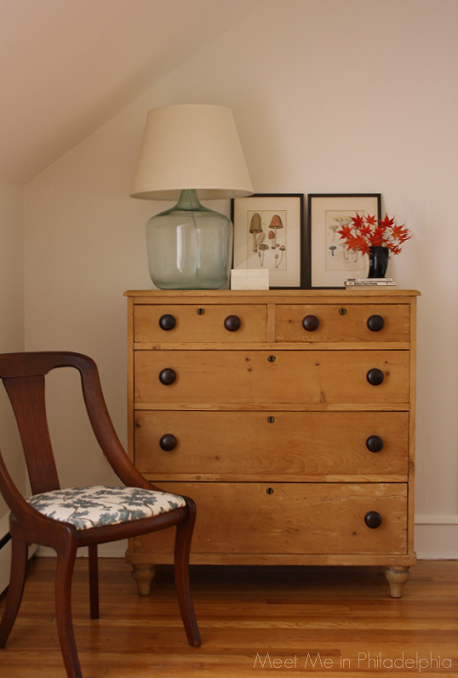 I wasn't exactly in the market for my first find; but when a piece like this antique six-drawer pine chest comes along, it's only a fool who passes it up. Believe me when I say that, if I passed on this chest of drawers, someone should have me committed. This makes two pine chests in our home...I sense a new obsession coming on. I found it for the low, low price of $75. Three quarters of a hundred dollars never looked so good. 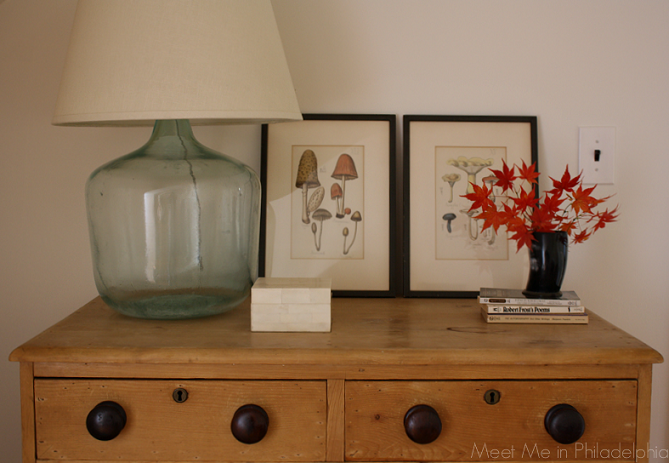 I styled up the pine chest with one of my antique Empire chairs, a demijohn lamp I had made and mushroom prints found at a flea market this summer. I'm digging the look. 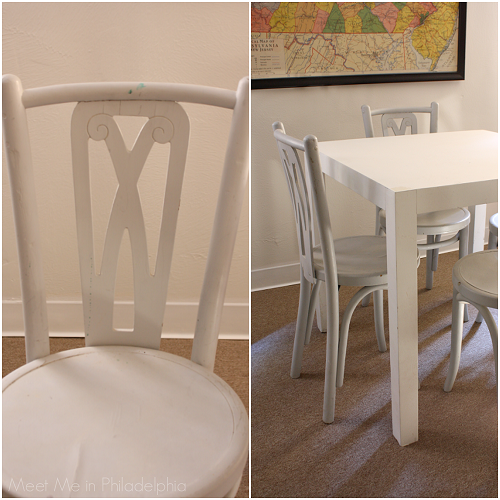 My second find, a white parsons-style table, now functions as a game table in our finished basement. The space down there is slowly coming together and a $30 bargain like this gets me closer to being ready to show it off. I discovered the matching set of unique bentwood chairs in Maine over the summer for $25/piece. They definitely need some new paint and new seats, but will be sensational when made over! Craigslist. Despite having to cull through pages of junk, diamonds can be found in the rough on Craigslist. I'm grateful for the ability to find beautiful bargains like these. Have you found any amazing items on Craigslist lately? What do you think of my finds? I go back and forth with Craigs List. I had found my oldest daughters bobbin style headboard on there for $10.00 last summer! That was my great find for sure. I also found my loveseat that I had reupholstered on there as well for $100.00 - not bad at all. 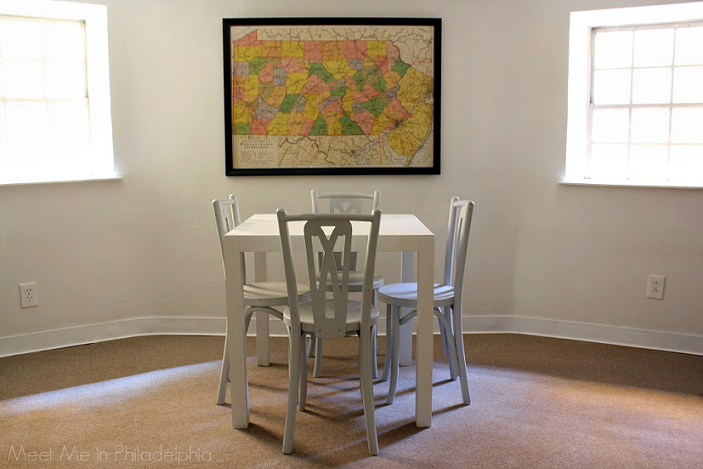 LOVE those chairs you have paired with the game table. Wonderful finds!! And, yes, definitely thankful for Craigslist. Sometimes I have a love/hate relationship with CL - depends on the day. I've lost out on a few things, but have probably gained more than I have lost. I'll look on the positive side. nice. I haven't hit up CL in a bit but you are right, it can be a gem! Wonderful items Leslie! That chest and your lamp are gorgeous!! Love your month of gratitude, I might copy that! Thanks for your support- have a great week! Thank you, Nancy! Glad you're liking the series! Fun finds my friend!! You styled them so well too!! Thank you, Karolyn. I like "play styling" a lot around here! Such great finds!! You have motivated me to go search my craigslist...wish me luck!! I love the pine chest of drawers and agree you would have been committed. You have a gift of finding the best items on Craigslist! the dresser is fantastic, but: those knobs! Killer. Stop it! That chest is WONDERFUL. Great finds! I think I know what I am doing today! Craigslist date for me. The pine chest has been on my "wish list" for ages. You are killing it with the pine chests. Sooo good. You inspired me to get onto craigslist even though I technically don't "need" anything. Kate: it's worth noting I definitely didn't NEED either the chest or the parsons table either. That didn't stop me! I love your pine chest and those bentwood chairs are amazing. I think I need me a piece of pine in my life. I haven't found anything noteworthy on CL lately. Lots of horrific sofas lately, but that doesn't stop my from obsessively stalking the CL looking for that diamond in the rough!! Hi Ashley, you have a lovely blog! We have no craiglist here in Spain,actually, second hand furniture is terribly expensive which is a shame as I love finding vintage furniture and of course, bargains (I am so jelous of your finds!!). I adore your pine chest obsession--can't believe the price on that! And a parsons table is always right. I picked up a craigslist find this week that I hope will be awesome...right now it is in a lot of pieces. A vintage brass bed! You have the touch my friend. That is a steal and it went to the right home. i love the dark round wood hardware with the light pine. ANd the table and chairs are perfect. They fit right in!